Watch Roger demonstrate how SmartNet® works – just click the image above. Average height of WTA and ATP top ten players (5 December, 2011) is 182 cm. The professionals are playing with a net height 50% of their average height, so why do not the younger players play tennis over a net 50% of their height? Now a change is coming to starter players! With a SmartNet® it will be easier to learn the technique, the tactics and also bring more joy to the starter players! A lower tennis net will not only make it easier for the young players to play tennis but also make it easier to learn the correct swing technique from the beginning. But it also helps the players to learn the tactics of the sport much easier. With our solution – the height adjustable tennis net, it will help players to serve easier, to have greater angles on the serve and also make it easier to learn forehand, backhand and other shots. It will also be easier to play volley with a lower net in front of the player. A lower net will be helpful to develop the tactics and technique much easier and in a more natural way. ATP and WTA top ten players have an average height of ca. 182 cm (ATP and WTA ranking at Dec 5, 2011) and the net height in the middle (91,4 cm) is almost exactly 50% of the average height of the ATP and WTA players. To make it easier and more fun for the players under 10, they should also have a net height of their 50%. SmartNet® is giving the players under 10 the possibility to learn the technique easier, to use a greater tactic ability and have more fun with a net that is designed to suit the height and motor skills of the player. “I am very positive about the concept and supporting the idea. The average height of WTA and ATP top ten players (5 December 2011) is 182 cm and the professionals are playing over a tennis net which is 50% of their height. So why do not the players under 10 also play tennis over a net that is 50% of their average heights? 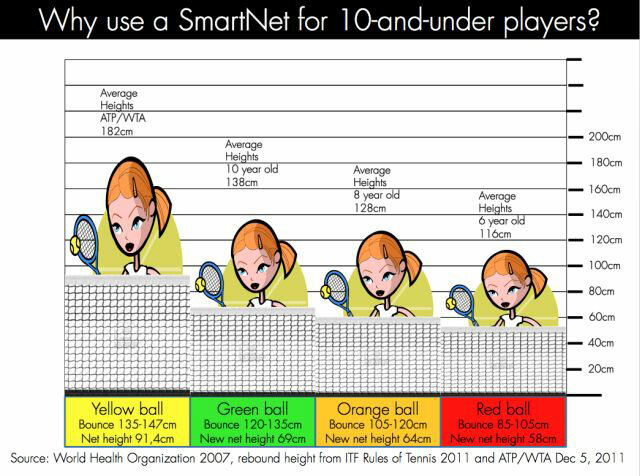 At YELLOW, tennis players will still be able to use the SmartNet® at a height of 91,4cm at the center of the net. The fifth level, BLACK, gives you as a coach the possibility to add 20 cm height over the yellow level to better practice topspins. With SmartNet®, the coach/parent or the players themselves are able to adjust the height of the net. With a simple adjustment, (it only takes seconds! ), they are now able to choose between five (5) different heights! An international study also confirms the effect of using a lower net. In the Journal of Sports Science Volume 33, Issue 10, June 2015, pages 1093-1100, the study about: The effect of equipment scaling on children’s sports performance: the case for tennis, was published. The study was made by Ewout Timmerman, Joel De Water, Kim Kachel, Machar Reid, Damian Farrow and Geert Savelsbergh. The influence of scaling court-size and net height on children’s tennis performance was examined. Sixteen boys (9.7 ± 0.5 years) had to perform a 30-min match in four different conditions, where court-size and/or net height were scaled by using a scaling ratio based on the differences in temporal demands between the children and the adult game. These 30-min matches were analyzed using Tennis Analyst (FairPlay Ltd., Jindalee, QLD, Australia) software to determine typical tennis match performance characteristics. Children hit more winners, more forced errors, played more volleys, struck more shots from a comfortable height and played in a more forward court position when the net was scaled. Scaling both the court and net lead to a faster children’s game, more closely approximating what is typical of the adult game. The differences between the typical tennis performance variables recorded suggested that scaling the net led to a more aggressive way of playing. Further, children enjoyed playing on the standard court–scaled net condition more than standard adult conditions. It is suggested that optimizing the scaling of net height may be as critical as other task constraints, such as racquet length or court-size, as it leads to a more engaging learning environment for experienced children.